Toree’s Stories: How are birds able to sing? Soundscape recording CD, available from Ash Meadows National Wildlife Refuge, by calling 775-372-5435. Music is composed of many sounds: harmonies between voices and perhaps a variety of instruments. A person singing alone can only make the song one note at a time. Birds, on the other hand, can produce notes simultaneously, which is part of what makes bird song so captivating. Birds have what is called the syrinx, which is located at the bottom of the trachea, rather than the top as in humans (the larynx) and contains no vocal cords. Sound is produced by the vibration of the walls of the syrinx. Since the organ is located below the trachea, each lung can push air separately through the syrinx, which allows the bird to make more than one sound at once, harmonizing with itself, so to speak. An example of a haunting, faintly echoing tune is given by the hermit thrush. We are most likely to spot this bird in the summer in this area; however, I have not had the pleasure of finding one so far. I suspect I have not been looking, or listening, in the right places. The bird is slightly smaller than an American robin, which is also a thrush, with grey/brown sides, a reddish tail and pink legs. He breeds in the forest, making a cup nest on the ground or in a bush, laying four or five blue-green eggs. His most distinguishing characteristic is his melancholy, flute-like song, expertly harmonized. Hear versions of his song at allaboutbirds.org. Being as focused on bird song as I am, I’m always on the lookout for stories or information about birds of our area. Recently I came across a story about an interesting person and I’d like to share him with you. There was an article in the Reno Gazette-Journal a short time ago that introduced me to Fred Bell, an amateur but avid recording hobbyist in the Las Vegas area. What began as a quest for quiet, inspired by Fred’s discovery of the work of Gordon Hempton, an acoustic ecologist and author of “One Square Inch of Silence,” turned into an appreciation of the sounds of nature with a burning desire to capture them to enjoy whenever the mood arose. His simple recorder evolved into elaborate recording equipment he assembled himself, to shield the recordings from wind and buzzing insects, and to better capture sound from all directions. The result is clear, crisp recordings of birds and other sounds of nature. About a year ago, he was struggling to identify the song of a bird he was recording at the Ash Meadows National Wildlife Refuge, about 90 miles northwest of Las Vegas, so he asked the visitor’s center for help. Staff recognized the quality of his work and a relationship between Fred and the refuge was born. Fred now donates his CDs to the refuge for sale in the small gift shop there. He has amassed about six hours of recordings which will play in a continuous loop when the new visitor’s center opens in a few months. The repetitious sounds of the birds “talking,” content in their habitat, the flapping of wings, along with the chirping of crickets, will lull you into thinking you are floating on a raft in a marsh. Contact the refuge by calling 775-372-5435 to request a copy of the CD. For about $10 postage paid, you will receive one hour of peace and tranquility, and proceeds benefit the refuge. 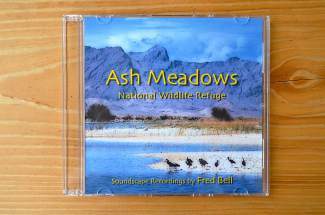 Fred has compiled this 60-minute CD from recordings he has made from around the refuge. Ash Meadows National Wildlife Refuge is the largest remaining oasis in the Mojave Desert. The spring-fed wetlands and alkaline desert uplands support nearly 30 species of plants and animals that do not exist anywhere else on the planet (called endemic species). Ash Meadows has the highest concentration of endemic species for its size in the United States and second highest in North America. The refuge was established in 1984 to protect rare and endangered species. Learn more at http://www.fws.gov/refuge/ash_meadows. Purchase Gordon Hempton’s nature recordings on Amazon.com, or download them from the iTunes store. The book that inspired Fred Bell to begin his pursuit of the perfect nature recordings, “One Square Inch of Silence: One Man’s Quest for Natural Silence in a Noisy World,” is also available on Amazon.com.